Enhance your outdoor seating area with the simple yet elegant Marseille Fire bowl by American Fyre Designs. Easy incorporated into any patio setting, this fire bowl is handcrafted from glass fiber reinforced concrete for strength and durability with a Smoke finish. Glass Fiber Reinforced Concrete (GFRC) is specially formulated using Portland cement, glass fibers, aggregates, and polymers to give a higher strength with a fraction of the weight of pre-cast concrete, and has superior durability in outdoor applications. GFRC cannot rust like steel and is weather resistant, fire retardant, and impermeable to give years of enjoyment with cast-in color and low maintenance. A 304 commercial grade stainless steel star burner and flexline are included. The burner produces 65,000 BTUs of heat and in glimmering flames and is controlled with a simple key valve. Fire glass is not included with this bowl. The recommended amount of fire glass for this fire bowl is 60 pounds. For lava rock, 30 pounds is required to properly cover the burner. American Fyre Designs exterior fire features and burners are warranted for three (3) years. All American Fyre Designs valves, electrical components, accessories, and controls (excluding batteries) are warranted for one (1) year. American Fyre Designs Fire Bowls take your outdoor entertaining to the next level with a contemporary design that’s sure to impress. These fire bowls come in three different sizes and several styles to choose from, making it easy to incorporate this fire feature into your outdoor space. Styles range from the traditional deep fire bowl to the low profile Marseille series. The deep fire bowl styles are available in 32”, 36”, or 48”, while the Marseille style is available in 32” and 48”. 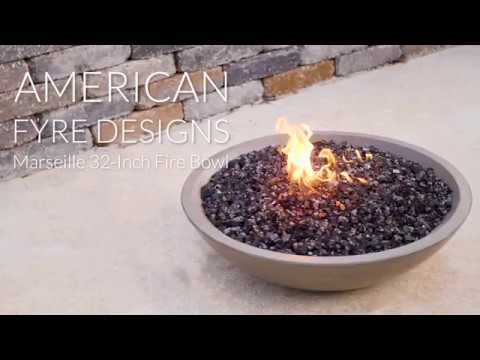 All of American Fyre Design’s Fire Bowls are available in a Smoke or Cafe Blanco finish. Both finishes are a beautiful, neutral coloration that makes it easy to fit right in with your outdoor space décor. The included 16” stainless steel star burner produces an impressive, adjustable flame while providing up to 65,000 BTUs of heat to keep you warm. We love that the burner is controlled by an easy to use key valve with match light ignition for a no-hassle start. Along with the burner, a hose and regulator are included with all American Fyre Designs Fire Bowls. They are available in either natural gas or propane. Each fire bowl is handcrafted in America and features weather resistant Glass Fiber Reinforced Concrete (GFRC) construction. This is stronger than concrete and lightweight when compared to traditional stone or terracotta materials, which makes installation easier. American Fyre Designs has a 3 year warranty on the exterior fire features and accessories, and a 1 year warranty on valves, burners, electrical components, and controls. The media isn't included, however this allows you to customize the look of your fire bowl with a wide array of fire glass, lava rock, creek stones, etc.